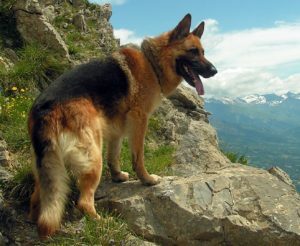 The best dog food for German Shepherds will almost never be particularly for small breeds, if you have one you know why. German Shepherds are one of the most popular large breed of dogs in today’s world and I think that could’ve been expected. With their high energy levels, how adorable they are, and their natural happiness who wouldn’t want one in their home? With all that’s been said, their happiness and energy levels depend on their diet and as a pet owner that puts a bit of a responsibility on your shoulders. So what large breed dog food is best for your German Shepherd? Merrick Classic Real Adult Beef – With real natural ingredients your german shepherd will receive a balanced diet of proteins, nutrients, minerals, fatty acids (from omega 3 and 6), and more. With 60% meat, 20% produce, and 20% whole grains your canines nutrient requirements are sure to be met. The number one ingredient being deboned beef this is top grade dog food that your pet will just love to eat. Taste of the Wild Dry Dog Food – Taste of the Wild has made it on the list of top dog foods for various breeds (including Chihuahuas, Huskies and Yorkies). With real smoked salmon (if you get salmon flavored dog food), fruits, vegetables, and antioxidants to provide a well rounded balanced diet. It’s also grain-free and beneficial to your wallet! The Honest Kitchen Dog Food – Honest Kitchen dog food has made their first appearance in the article on dog food for huskies and they have become immensely popular among dog owners that it’s made this list as well. The Honest Kitchen has made their dog food human grade meaning even us, humans, can safely consume it. The protein source they use (whether it being duck, beef, chicken, or turkey) is always grown right and hormone free. Top quality ingredients for a fairly decent price – what a bang for your buck! Royal Canin Adult Dry Dog Food – Specifically engineered for German Shepherds. They have taken in account the sensitive skin, double layered coat, and higher chance of hip dysplasia that this breed has to configure the ingredients of this dog food. Royal Canin ensures that this will maintain skin and coat health, and promote the performance of their digestive system. Wellness Complete Health Large Breed – As some of the other dog foods mentioned above, Wellness Complete has also made a few appearances across various articles on the top dog foods for particular breeds (including, but not limited to, Golden Retrievers). This large breed formula is packed with the right amount of nutrients, minerals, proteins, and premium ingredients to keep your German Shepherd healthy and active. The larger kibble size that is included in this helps promote healthy hips and joints (which comes in handy for this specific breed).